I can’t really pretend that Fennel is a favourite of mine. I’m not all that keen on the aniseed taste – but once in a while, it’s a very handy herb to have around. In fact it’s a main player. For what? For flatulence, my friend! If you’ve ever eaten too much and watched your abdomen swell like a balloon (my worst experience of that was eating too much cheese fondue… I’ve never been able to face it again) when you can’t get comfortable and your waistband feels like it might pop, Fennel is what you need. The seed, to be exact, although I find the stalks and leaves just as aromatic. 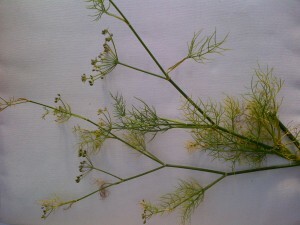 Fennel seed is the part that we traditionally use. It’s also the main ingredient in baby’s gripe water as it not only gives the wind safe passage (!) but eases the cramping pain associated with it too. The seeds also make an appearance as an ingredient in colourful bowls of mukhwas often seen in Indian restaurants to eat after meals to freshen the breath and aid digestion.